American Internet media and services company AOL this morning reported its financial results for the third quarter of this year, reporting earnings of 22 cents per share compared to a loss per share of 2 cents in Q3 2011. AOL was expected to report third-quarter earnings of 17 to 19 cents a share, so the results came in above expectations. AOL’s total revenue was flat compared to the third quarter of 2011 at $531.7 million, with operating income climbing to $43.1 million and net income reaching $20.8 million for the three months ended September 30, 2012. 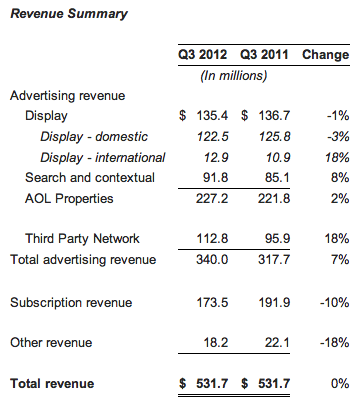 Total ad revenue came in at $340 million for the quarter, up 7 percent from $317.7 in Q3 2011. For Q2 2012, AOL had reported total revenues of $531 million. Last quarter, AOL’s income from advertising grew an impressive 7 percent in combined AOL Properties Display and Third Party Network revenue, which totaled $248.2 million for the period. The company also notes 8 percent year-over-year growth in Search and Contextual revenue, representing its first quarter of YoY growth in over 3 years. AOL says this jump was “driven primarily by continued double-digit growth in search revenue on AOL.com”. Search and contextual revenue growth was impacted by a decline in queries from domestic AOL-brand access subscribers and from cobranded portals. Global display revenue declined 1 percent year-over-year, reflecting a (worrying) 3 percent decline in domestic display revenue, partially offset by double-digit growth in international display advertising revenue, AOL notes in its earnings release. The Internet giant says unique visitors to AOL properties in Q3 2012 totaled 111 million, growing 4 percent year-over-year, but slightly down compared to Q2 2012. Shares of the company have more than doubled so far this year, hitting a 52-week high of $37.94 on October 17. In late August, AOL announced plans to distribute a special cash dividend of $5.15 a share to stockholders before the end of this year. 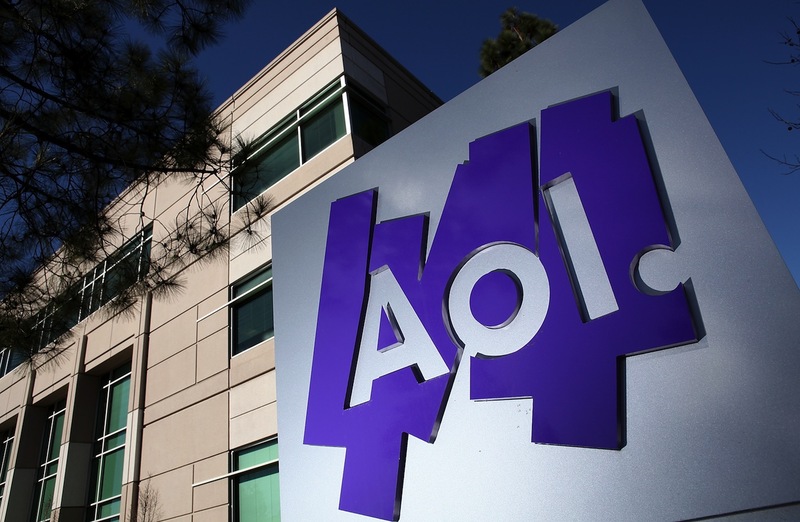 AOL had approximately $867 million of cash and equivalents at September 30, 2012.